The university has one kiosk station on main campus that serves as a gateway to the Main Building. It is staffed Monday through Friday from 7:30 a.m. to 3:30 p.m. The area previously known as Speedway Ave from Jester Circle to 23rd Street is now the Speedway Pedestrian Mall. As this is a pedestrian priority area, access by vehicles is limited to those who require it to maintain and support the university mission and for emergency purposes. Pedestrians always have priority. Bicycles, skateboards, and carts also have access. Caution should be used for any vehicle entering the Speedway Pedestrian Mall area. Bollards have been installed along 21st St, both east and west of the new Speedway Pedestrian Mall. The position of the bollards, either raised or lowered, is not an indication of access. Only vehicles that have authorization from PTS may enter or cross the Speedway Pedestrian Mall. Note that the bollard will make a beeping sound while moving up and down. The intercom is answered 24/7 and should be utilized for emergency access or when your tag or card is malfunctioning. Parking on Speedway Pedestrian Mall is provided in designated areas only (See Map). Parking locations are mixed use for carts and university vehicles or those that have been authorized by PTS and issued a PTS Speedway Permit. The university is not responsible for fire, theft, damage, or loss to vehicles operated on the university campus. No bailment is created by granting any parking or operating privileges regarding a vehicle on any property owned, leased, or otherwise controlled by the university. All requests for access must be sent to parking@utexas.edu by the Director, Chair, or Dean’s Office of a department/college for review. All departments are encouraged to limit their requests for access credentials to essential vehicles only. PTS will work diligently with all departments to ensure that access required for business needs is met while balancing the safety of pedestrians. If the request is approved, you will receive instructions on the next steps. If the request is denied, you will be notified of the decision and why it was denied. Please use the subject line: "Speedway Bollard Access"
The AVI tag will be installed at the Fleet Automotive Shop in FC6. The TX/AVI tag will allow access, but access should be limited to essential and emergency operations. Tags are not active during class change from Monday to Friday. See our Bollard Access Schedule (PDF) to see details. 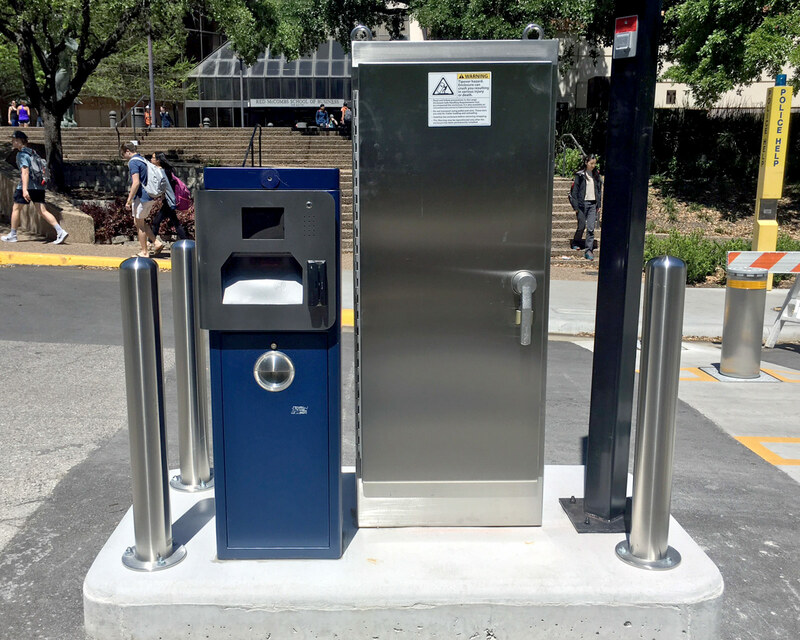 Bollards are active on Saturday and Sunday with no time restrictions. Access may be limited for those vehicles that do not have an issued AVI tag. Only university-affiliated carts/motorcycles/mopeds/scooters are authorized to pass beyond the bollards. If the cart is able to maneuver through the bollards, it does not need to have an AVI tag. If the cart is unable to maneuver between the bollards, AVI tags can be issued by following the Vehicle Access Request outlined here. Cart/Motorcycle/Moped/Scooters may not access the Speedway Pedestrian Mall area by using the sidewalks. Bicycles may access the area beyond the bollards at any time, but must yield to pedestrians in all cases. Bicycles must take care when passing the bollards when they are in the down position, as they may begin to rise. 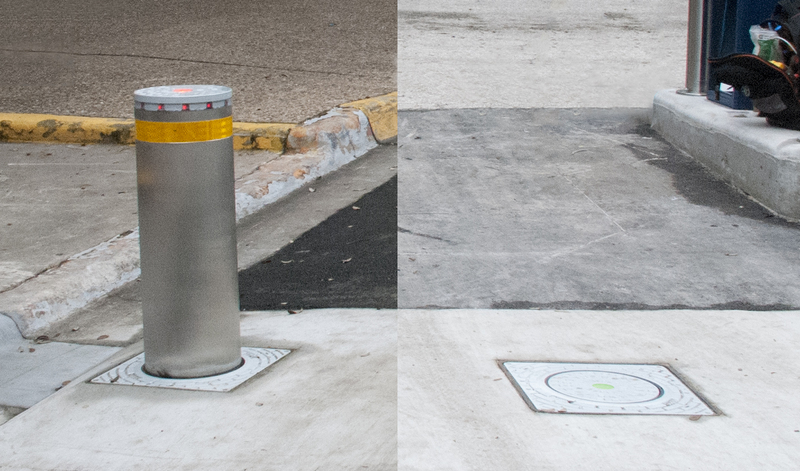 The bollards that raise/lower are denoted by painted yellow blocks on the east and west side of each bollard. You may continue to schedule deliveries to buildings and events in the area via the Event Parking Request Form. Our event staff will coordinate furniture and equipment deliveries as we have done in the past. 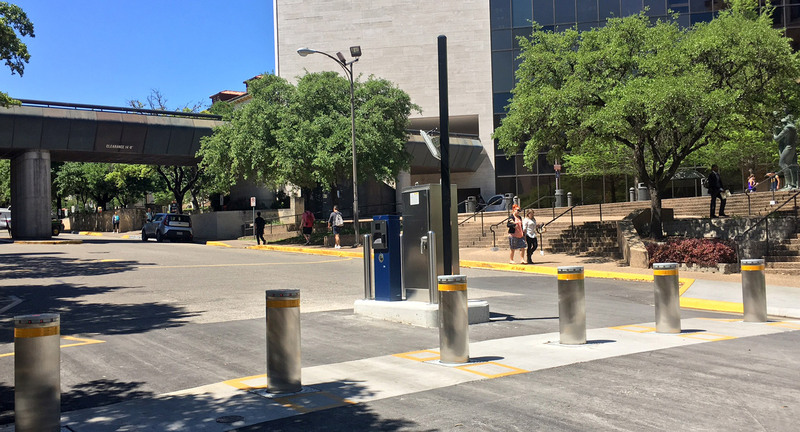 For those that require other business related access, please email parking@utexas.edu [subject line: 21st St Bollard Access OTHER].